A couple of weeks ago, someone noticed a little strange gesture made by your Parish Priest but it took him another week to pose the question to me. “Why did you remove your stole during the mass?” It was Thursday and I had invited Fr Esmond to be the main celebrant at the Thursday weekday mass in Kristus Aman. That was fortuitous in more ways than I knew at that time. Not only did it relieve me of having to preside at mass and preach, but Fr Esmond saved me from an awkward and embarrassing situation of not being properly attired. As I was leaving for Kristus Aman, in my excitement and carelessness, I had grabbed my cotta (choral attire meant for the Holy Hour), but had forgotten to take my alb – the long white gown which a priest is supposed to wear when celebrating mass. To make a long story short, I wore the stole to proclaim the gospel and distribute Holy Communion because these were ministerial roles but I had to take it off during the Eucharistic Prayer, because I could not be a con-celebrant as I was not appropriately attired. Make sense? If clothes make the man, then surely vestments make the priest! This may seem to be an outrageous claim coming from a man of God who is expected to shy away from all displays of vain-glory. But it expresses a sacramental truth about the vestments of a priest. The vestments of a priest do actually reveal the mystery of who he is – the priest acts and stands in persona Christi, in the person of Christ. Of great significance and yet something which is seldom noticed since it is often not visible to the congregation, is the stole – a long narrow band of material worn around the neck of priests. The stole has ancient origin. Rabbis wore prayer shawls with tassels as a sign of their authority. The crisscrossing of the stole also was symbolic of the crisscrossed belts the Roman soldiers wore. In this sense, the stole reminds the priest not only of his authority and dignity as a priest, but also of his duty to preach the Word the God with courage and conviction. 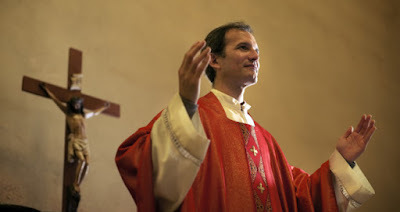 Though the stole is a sign of a priest’s authority, it is properly worn underneath, indeed hidden beneath the chasuble, the outer garment of the priest. The chasuble is a symbol of the charity or love of Christ. Taken together, the stole beneath the chasuble reminds the priest that authority is never to be flaunted but always exercised under the cover of charity. But the common perception of authority is anything but charitable. One tragedy of our time is that “authority” has become almost a dirty word in the Western world, while opposition to authority in schools, families and society generally is cheerfully accepted as something that is at least harmless and perhaps rather fine. “Authority” is a word that makes most people think of law and order, direction and restraint, command and control, dominance and submission. Authority in all its incarnation is often regarded as the denial or suppression of our personal freedom. Many hate the very idea that anyone or any power could ever tell them what to do. The problem that we face today is not that we attempt to hide authority under the cover of charity, but that we choose to bury it altogether! Perhaps, the real reason for this widespread dislike and suspicion of authority is that we often equate it with power. Yes, authority is related to power, but they are two entirely different concepts. Power is the ability to influence the outcome of events. Power- may be correctly used power, when it is tied to authority; or it may be incorrectly used power; it may be power exerted by sheer force and coercion. Authority, on the other hand is rightful or legitimate power. Therefore, someone with authority does not only have power, but can legitimately and rightfully weal that power. It is power without authority that spells trouble. If authority speaks about our dependence on and relation to the one who confers it, blind power often suggests independence from any source. This is the crux of the problem today – we want power but have little regard for real authority. In today’s gospel, Jesus exhibits power in driving out a demonic spirit. We can often get lost in paying undue attention to the exorcism performed by Jesus. But more significantly, this gospel reading highlights the connected themes of “authority” and “freedom.” The people recognised the authority of Jesus’ teachings but they did not fully understand that authority. At this stage of the gospel, only the demon is able to recognise Him, for the power of evil knows its adversary, it knows that the time of its defeat and destruction has come. The demon understands that Jesus comes with the authority of God. The story reflects the great cosmic battle between the power of God and that of evil, where God proves to be triumphant. The authority of Christ is one which frees man from enslavement to sin and evil. He shows us that there is no false dichotomy between freedom and authority. Freedom without authority will ultimately lead to enslavement to one form of addiction or another, or to man’s own intrinsic tyranny. Authority, which does not facilitate freedom, will also lead to the abuse of power and authoritarianism. When power is separated from authority, it descends into authoritarianism. Authoritarianism is authority corrupted, twisted. Authoritarianism is never accountable. But true authority is sacrificial and giving. Such authority is a matter of service rather than one which lords over others. It is an authority that liberates rather than one which subjugates and enslaves. And just as a priest wears his stole beneath his chasuble, there can be no true exercise of authority unless it is exercised with charity. And when true authority is abdicated, so is love abandoned. Today, modern man fails to recognise the irony of his predicament. He believes that the rejection of any external authority, especially in the area of moral authority, will guarantee his personal liberty and freedom. On the contrary, the drift from the authority of Truth – indeed from acknowledging any external authority at all, whether it be the authority of God or of the Church, is producing disintegrated, distracted and self-absorbed individuals and a disordered and anarchic society. We are indeed possessed by demons of a different kind, waiting for emancipation that can only come when we recognise the authority of God. Real freedom is only ever found under authority — God’s authority in Christ and that same authority now exercised by the Church. It is freedom not to do wrong, but to do right; not to break the moral law, but to keep it; not to forget God, but to cleave to Him every moment, in every endeavour and relationship; not to exploit others, but to lay down one’s life for them. When the Church and its leaders exercise authority today, it does so at the service to Charity and Truth. When the Church and its leaders continue to teach, to sanctify and to govern with authority, they do so in the name of Christ, Our Teacher, High Priest and Shepherd. When they act with authority, they make present the voice of Christ who continues to proclaim the timeless gospel message: “The time is fulfilled, the Kingdom of God is at hand. Repent and Believe in the good news.” And so when these leaders abdicate their authority in the name of misplaced democracy or as a cultural compromise, they set aside more than just their own personal power. They act not under their own authority but that of another, of Christ. This is the reason why their stoles are worn under their chasubles. It is no simple fashion statement, but a reminder that the hallmark of the priesthood, in fact the hallmark of all authority is pastoral charity.